Purpose: The purpose was to report the refractive and visual outcomes of laser-assisted subepithelial keratectomy (LASEK) for the treatment of myopia. Materials and Methods: A retrospective, noncomparative consecutive case series of 173 of 91 patients who had undergone LASEK is presented. Primary outcome variables included uncorrected visual acuity (UCVA), best spectacle-corrected visual acuity (BSCVA), manifest refraction, epithelialization time, pain, haze, and complications. Results: Preoperatively, the mean spherical equivalent (SE) was −3.71 ± 1.63 D (range, −0.875 D to 8.25 D), and the mean LogMAR BSCVA was −0.0374 ± 0.0767 D (range, −0.47 D to 0.00 D). On the final visit, the mean SE was −0.05 ± 0.335 D (range, −1.63 D to 1.00 D), the mean LogMAR UCVA was 0.04674 ± 0.0771 D (range, −0.3010 D to 0.1249 D) and the mean LogMAR BSCVA was −0.0164 ± 0.0497 (range −0.3010 to 0.124). All eyes achieved vision of 20/40 or better, and 83.2% of the eyes achieved a vision of 20/25 or better. One 64 (94.94%) and all the eyes were within ± 0.50 D and ± 1.00 D of the attempted correction respectively. 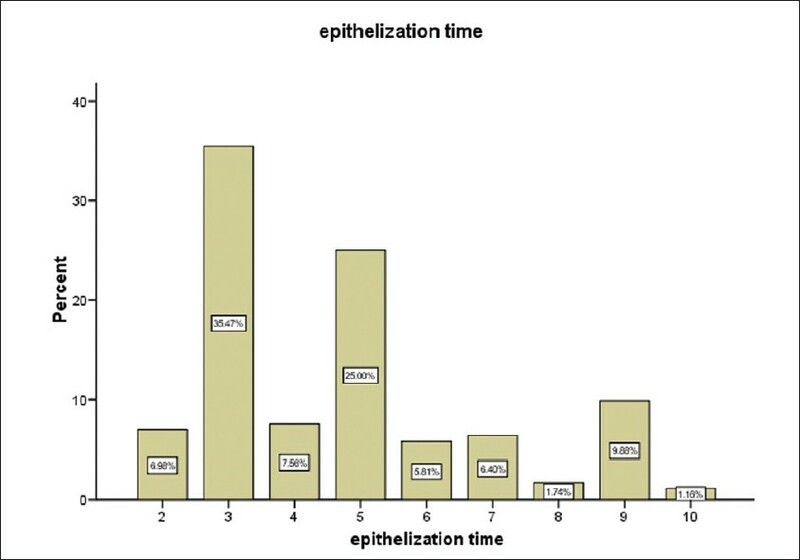 Complete epithelialization occurred in 4.70 ± 2.09 days (range, 2-10 days). At the final visit, 79.7% of eyes had a clear cornea. Grade 1 haze developed in 17.34% of the eyes, grade 2 haze developed in 2.89% of eyes developed; no eyes developed grade 3 or 4 haze. Conclusions: LASEK is a safe, effective, and predictable method for the treatment of myopia and myopic astigmatism. Advanced surface ablation has become the preferred corneal refractive surgery for many refractive surgeons. This is due to fewer complication rates compared to laser in situ keratomileusis (LASIK) ,, specifically, no flap- and flap-related complications, and very minimal risk of ectasia. In Saudi Arabia and similar regions with a very high incidence of vernal keratoconjunctivitis and consequently, keratoconus and keratoconus suspects, surface refractive treatments may be more appropriate. Laser-assisted subepithelial keratomileusis (LASEK), and recently, epithelial laser in situ keratomileusis (Epi-LASIK) are surface ablation procedures, where an epithelial flap is created and preserved, which combines the advantages of both LASIK and photorefractive keratectomy (PRK), while mitigating the complications of both procedures. ,,,, Although Epi-LASIK represents a recent development in refractive surgery technology, I personally prefer performing LASEK to avoid using the suction ring and the significant increase in intraocular pressure. In my opinion, performing LASEK means "stress free refractive surgery." This study evaluated the efficacy, predictability, and safety of LASEK for the treatment of myopia and myopic astigmatism. Approval from the Institutional Review Board of Magrabi hospitals was obtained for the study, and a chart review was performed of 250 eyes that underwent LASEK. All surgeries were performed by the same surgeon (F.M.T.) between July 2008 and January 2010. The database was compiled by excluding all eyes that had a preoperative manifest sphere greater than 7.50 diopters (D), hyperopic sphere, cylinder of more than 3.00 D, preoperative best spectacle corrected visual acuity (BSCVA) of 20/40 or worse, and cases targeted for near or partial correction. A total of 173 eyes were reviewed after excluding 77 eyes which did not meet the inclusion criteria. All patients were 18 years of age or older and had between 0.00 D and −7.50 D of myopia with up to −3.00 D of astigmatism. The preoperative evaluation included uncorrected visual acuity (UCVA; LogMAR notation), best spectacle-corrected visual acuity (BSCVA), manifest and cycloplegic refractions, ocular dominance, slit-lamp examination, keratometry, tonometry, pachymetry, placido disk-based computerized videokeratography, elevation-based computerized videokeratography (Pentacam, Oculus GmbH. Wetzlar, Germany), aberrometry (OPD-Scan, Nidek Co. Ltd., Gamagori, Japan), mesopic pupil size measurement using a pupillometer, and dilated fundus examination. After topical anesthesia, a lid speculum was inserted, a semisharp circular well was used to administer 25% alcohol for 25-30 seconds on the corneal epithelial surface. Prior to alcohol exposure, positioning marks were used to mark the corneal surface. The margins of the delineated area were freed using vannas scissors and jeweler's forceps and leaving 2-3 clock-hours of intact margins for the hinge. The loosened epithelium was then peeled back using a Merocel sponge. After standard laser ablation, the epithelial sheet was gently repositioned using intermittent irrigation. The epithelium was carefully realigned using the preplaced positioning marks and allowed to dry for 3-5 minutes. A combination of antibiotics and steroids eye drops was applied, followed by placing a bandage contact lens to reduce the mechanical friction by the eyelid and to reduce postoperative pain. The CXIII excimer laser (Nidek Co. Ltd., Gamagori, Japan) was used for laser ablation. The humidity in the Jazan area is very high reaching up to 90%; hence a dehumidifier was used in the room to reduce humidity to 40%. Prophylactic mitomycin-C (MMC) 0.05% was applied for 15-60 seconds in eyes that had more than 70 μm of ablation, to reduce the risk of haze formation. The postoperative regimen varied according to the depth of ablation. If the depth of ablation was more than 70 μm, topical antibiotics and prednisolone acetate 1% eyedrops four times per day for 2 weeks, followed by fluorometholone for 2-3 months on a tapered dose was prescribed. If less than 70 μm of ablation, topical antibiotics and prednisolone acetate 1% eye drops four times per day for 1 week, followed by fluorometholone for 1 month on a tapered dose was provided. Lubrication was prescribed as required. Patients were reviewed every day or every other day until corneal epithelial healing was complete. After complete re-epithelialization, patients were followed up at 2 weeks, 1 and 3 months. The study cohort comprised 173 eyes of 91 patients who underwent LASEK. There were 29 males and 62 females. The mean age was 26.72 ± 5.1 years (range, 18 years to 40 years). [Table 1] demonstrates that the mean preoperative spherical equivalent refraction was −3.71 diopters (D) ± 1.63 D (range, −0.88 D to −8.25 D). The mean preoperative LogMAR BSCVA was −0.0374 ± 0767 (range −0.47 to 0.00) and the mean follow-up was 32 weeks. As healing progressed, the migrating new epithelium gradually replaced the epithelial sheet over 2-10 days. Complete epithelialization occurred in 4.70 ± 2.09 days [Figure 1]. Complete epithelial healing occurred by the fifth postoperative day in 75% of the eyes. The mean UCVA at the final visit was 0.04674 ± 0.07710 (range −0.3010 LogMAR to 0.1249 LogMAR). 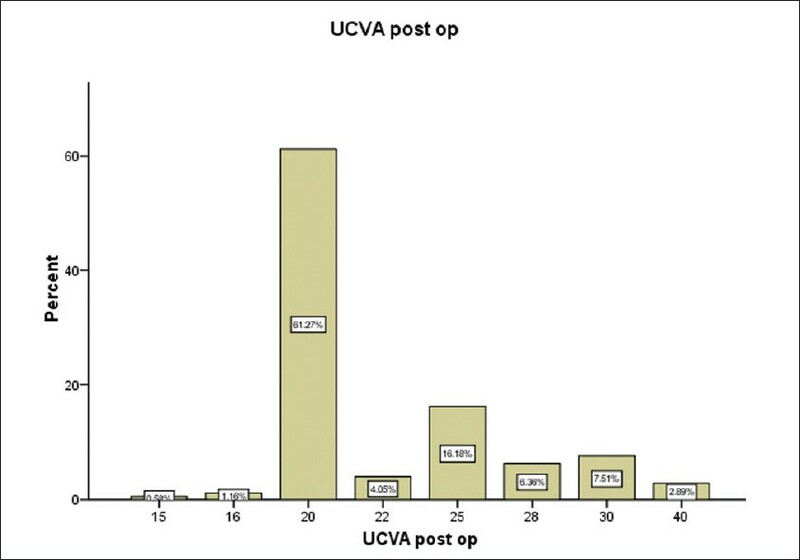 Approximately two-thirds (63.0%) of the study population presented with UCVA of 20/20 or better and 83.2% had UCVA of 20/25 or better while all the operated eyes had UCVA of 20/40 or better [Figure 2]. The efficacy index was 0.98, which is the ratio of mean postoperative LogMAR UCVA converted to decimal to mean preoperative LogMAR BSCVA converted to decimal. The mean postoperative spherical equivalent was −0.05 ± 0.335D (range −1.63 to 1.00D) [Table 2]. One sixty-four (94.94%) and all the eyes (100%) were within ± 0.50 D and ± 1.00 D of the attempted correction respectively [Figure 3]. The mean postoperative BSCVA was −0.0164 ± 0.0497(range, −0.3010 LogMAR to 0.124 LogMAR). 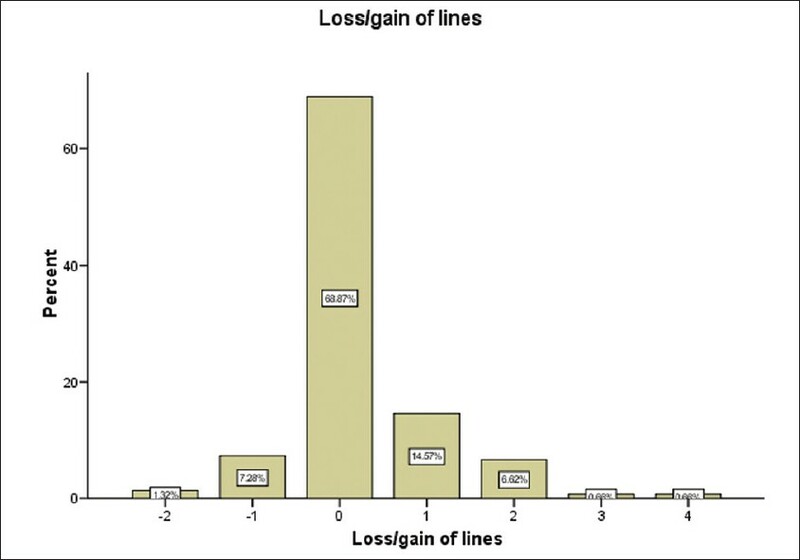 [Figure 4] depicts that at the final follow-up visit, two eyes (1.32%) lost two lines [Figure 4]. More than two-thirds of eyes (68.9%) had no loss of postoperative BSCVA and no eye lost more than two lines, 22.4% of eyes gained one line to four lines.Overall, the safety index which is the ratio of mean postoperative BSCVA to mean preoperative BSCVA at the final visit was 1.05. At final visit, 79.7% of the operated eyes had a clear cornea. More than one-sixth (17.34%) of the eyes developed grade 1 haze while only 2.89% eyes developed grade 2 haze. 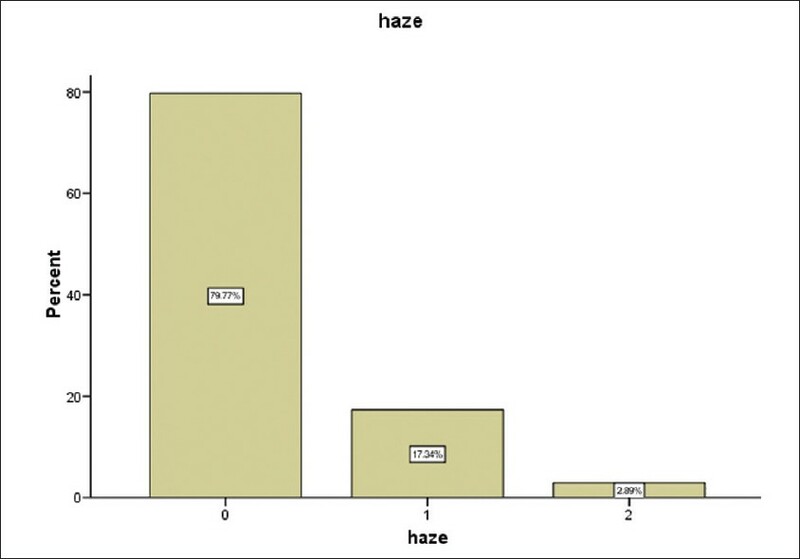 No eyes developed grade 3 or 4 haze [Figure 5]. The only postoperative complications observed was pain with 90.7% of the patients experiencing mild pain. Only two patients (1.2%) had moderate pain and 14 patients (8.1%) had severe pain [Figure 6]. In the present study, epithelial separation was successfully performed with alcohol in all eyes without complications. The epithelium was easily repositioned over the corneal surface and the edges were aligned to the initial margin but often the epithelial flap extended beyond the margin. Postoperatively the epithelium remained attached without significant dislodging or breakdown. The epithelial border migrated from the corneal periphery towards the center of the corneal surface during the healing phase. Seventy-five percent of the eyes showed complete epithelial healing by the fifth day while Feit et al., have observed that 78% of 101 eyes had undergone healing by the third day. The difference between studies could be due to the retrospective design of the past study. However, there was agreement in the mean LogMAR UCVA between the studies which was 0.03 in Feit et al. 's  study and 0.04 in our study. Several reports in the literature have documented the safety, efficacy, and predictability of LASEK. Shahinian  and Azar et al. found that all the patients demonstrated an UCVA of 20/40 or better. In the present study, 63.0% of the study cohort presented with UCVA of 20/20 or better and all the subjects had 20/40 or better which is similar to Vandorselaer et al. who observed 96% eyes with UCVA of 20/40. 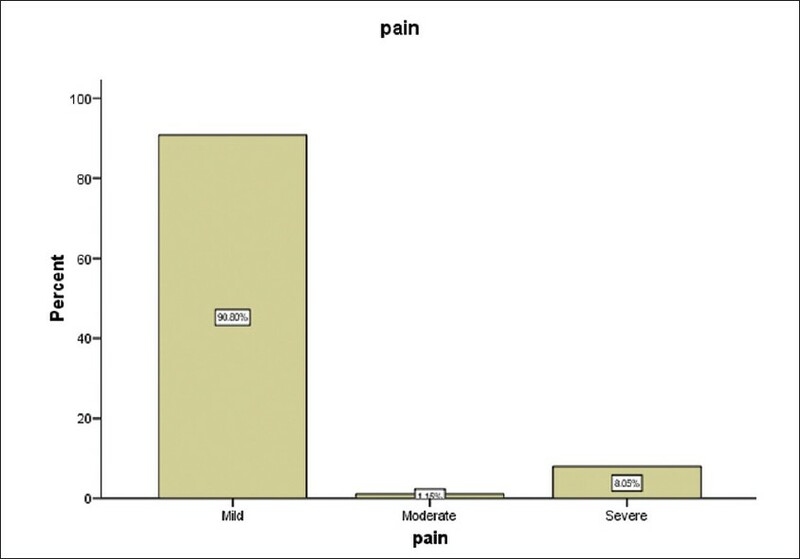 Though Lee et al.,  Azar et al.,  and Kornilovsky  reported pain in only 66.6%, 53%, and 63% of patients respectively, it was interesting to note that all the patients in the present study reported some grade of pain while only 16 patients complained of moderate to severe pain. In conclusion, LASEK was effective, predictable, and safe for the treatment of low myopia and myopic astigmatism.No sight threatening complications were observed other than pain and haze. However, long-term prospective studies of effectiveness and safety of LASEK are warranted. 1. Pallikaris IG, Kymionis GD, Astyrakakis NI. Corneal ectasia induced by laser in situ keratomileusis. J Cataract Refract Surg 2001;27:1796-802. 2. Binder PS, Lindstrom RL, Stulting RD, Donnenfeld E, Wu H, McDonnell P, et al. Keratoconus and corneal ectasia after LASIK. J Refract Surg 2005;21:749-52. 3. Teichmann KD. Bilateral keratectasia after laser in situ keratomileusis. J Cataract Refract Surg 2004;30:2257-8. 4. Azar DT, Ang RT. Laser subepithelialkeratomileusis: Evolution of alcohol assisted flap surface ablation. Int Ophthalmol Clin 2002;42:89-97. 5. Taneri S, Feit R, Azar DT. Safety, efficacy, and stability indices of LASEK correction in moderate myopia and astigmatism. J Cataract Refract Surg 2004;30:2130-7. 6. Taneri S, Zieske JD, Azar DT. Evolution, techniques, clinical outcomes, and pathophysiology of LASEK: Review of the literature. Surv Ophthalmol 2004;49:576-602. 7. Lee JB, Seong GJ, Lee JH, Seo KY, Lee YG, Kim EK. Comparison of laser epithelial keratomileusis and photorefractive keratectomy for low to moderate myopia. J Cataract Refract Surg 2001;27:565-70. 8. Cimberle M, Camellin M. LASEK technique promising after 1 year of experience. Ocular Surg News 2000;18:14-7. 9. Holladay JT. Visual acuity measurements. J Cataract Refract Surg 2004;30:287-90. 10. Hashemi H, Fotouhi A, Foudazi H, Sadeghi N, Payvar S. Prospective, randomized, paired comparison of laser epithelial keratomileusis and photorefractive keratectomy for myopia less than -6.50 diopters. J Refract Surg 2004;20:217-22. 11. Kaya V, Oncel B, Sivrikaya H, Yilmaz OF. Prospective, paired comparison of laser in situ keratomileusis and laser epithelial keratomileusis for myopia less than -6.00 diopters. J Refract Surg 2004;20:223-8. 12. Hondur A, Bilgihan K, Hasanreisoglu B. A prospective bilateral comparison of epi-LASIK and LASEK for myopia. J Refract Surg 2008;24:928-34. 13. Reilly CD, Panday V, Lazos V, Mittelstaedt BR. PRK vs LASEK vs Epi-LASIK: A comparison of corneal haze, postoperative pain and visual recovery in moderate to high myopia. Nepal J Ophthalmol 2010;2:97-104. 14. Pirouzian A, Thornton JA, Ngo S. A randomized prospective clinical trial comparing Laser Subepithelial keratomileusis and photorefractive keratectomy. Arch Ophthalmol 2004;122:11-6. 15. Feit R, Taneri S, Azar DT, Chen CC, Ang RT. LASEK results. Ophthalmol Clin North Am 2003;16:127-35. 16. Shahinian L Jr. Laser-assisted subepithelial keratectomy for low to high myopia and astigmatism. J Cataract Refract Surg 2002;28:1334-42. 17. Azar DT, Ang RT, Lee JB, Kato T, Chen CC, Jain S, et al. Laser subepithelialkeratomileusis: Electron microscopy and visual outcomes of flap photorefractive keratectomy. Curr Opin Ophthalmol 2001;12:323-8. 18. Vandorselaer T, Hermiat JJ, Schraepen P, Trau R, Tassignon MJ. 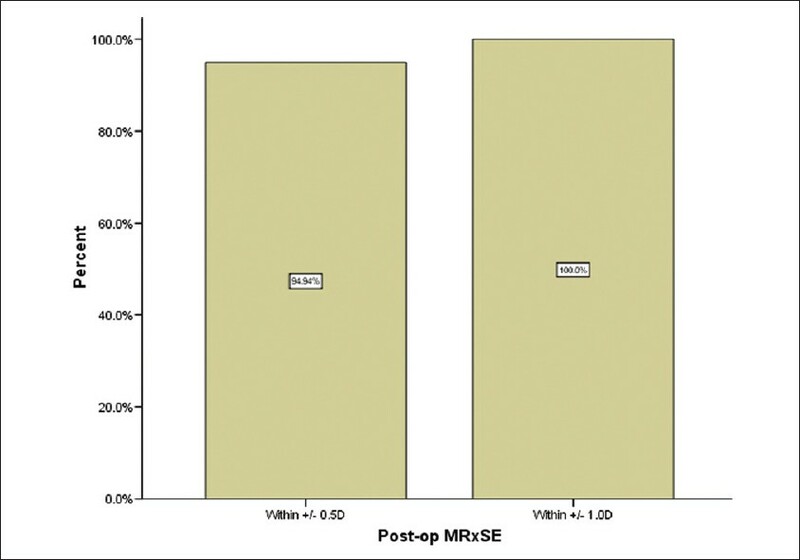 LASEK for myopia: First results. Bull Soc Belge Ophtalmol 2003;290:59-68. 19. Duong MH, Gatinel D, Hoang Xuan T. Laser epithelial keratomileusis for the treatment of low to moderate myopia: Preliminary results [Article in French]. J Fr Ophtalmol 2002;25:909-14. 20. Partal AE, Rojas MC, Manche EE. Analysis of the efficacy, predictability, and safety of LASEK for myopia and myopic astigmatism using the Technolas 217 excimer laser. J Cataract Refract Surg 2004;30:2138-44. 21. Gabler B, Winkler von Mohrenfels C, Herrmann W, Lohmann CP. [Laser epithelial keratomileusis (LASEK) for treatment of myopia up to -6.0 D. Results from 108 eyes after 12 months [Article in German]. Ophthalmologe 2004;101:146-52. 22. Autrata R, Rehurek J. Laser-assisted subepithelial keratectomy for myopia: Two-year follow-up. J Cataract Refract Surg 2003;29:661-8. 23. Rouweyha RM, Chuang AZ, Mitra S, Phillips CB, Yee RW. Laer epithelial keratomileusis for myopia with the autonomous laser. J Refract Surg 2002;18:217-24. 24. Kitazawa Y, Sawai H, Tajiri C, Toshida K, Saishin M. [Early clinical results of laser epithelial keratomileusis]. [Article in Japanese]. Nihon Ganka Gakkai Zasshi 2003;107:249-56. 25. Kornilovsky IM. Clinical results after subepithelial photorefractive keratectomy (LASEK). J Refract Surg 2001;17(2 Suppl):S222-3. 26. Chalita MR, Tekwani NH, Krueger RR. Laser epithelial keratomileusis: Outcome of initial cases performed by an experienced surgeon. J Refract Surg 2003;19:412-5. 27. Camellin M. Laser epithelial keratomileusis for myopia. J Refract Surg 2003;19:666-70.